Philippe Bhering has an LLB from the Candido Mendes University of Rio de Janeiro and an LLM from Ludwig-Maximilians University in Munich. He has worked as a guest researcher at the Max Planck Institute and as a research assistant at the International Max Planck Research School for Competition and Innovation. He is a PhD candidate at Ludwig-Maximilians University. Mr Bhering has authored several articles for important national and foreign intellectual property-focused publications. 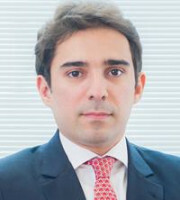 His expertise in intellectual property has been recognised by a number of such publications, who recommend him as a leading IP lawyer in Brazil, with foreign expertise. Mr Bhering is an active participant in national and international IP associations. He often delivers lectures on relevant topics in intellectual property and related areas. His international experience is continually evolving due to his active engagement in the legal committees of international associations. He has repeatedly been a committee member of the International Trademark Association and the trademark law and practice team of MARQUES. Mr Bhering specialises in patents, trademarks, copyright, software, e-commerce, licensing, enforcement against unfair competition and counterfeiting, and IP litigation, both in civil and criminal spheres. Mr Bhering is fluent in Portuguese, English and German.